4C's:- Four Characteristics that determine the quality and value of a diamond. Cut:- There is Cut. And then there'a Cut Many people confuse cut with the shape of a diamond. 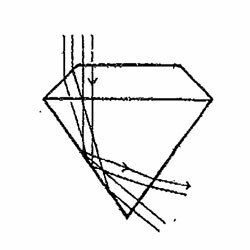 Diamonds are cut into a number of shapes; depending on the nature of rough diamond. 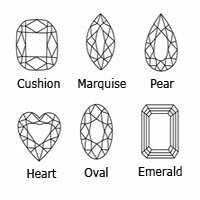 The most popular are Round, Marquise, Oval, Pear, Heart and Emerald; and the choice is largely a matter of personal preference. 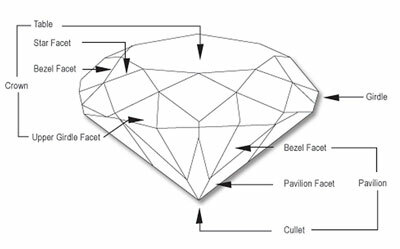 Whatever the shape, however, a well cut diamond is the work of a master diamond cutter. When cut to good proportions, the diamond is better able to handle light, creating more scintillation, more sparkle and that's a great reflection on you. It is the cut that enables a diamond to make the best use of light. 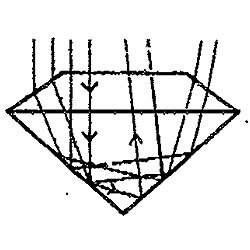 When a diamond is cut in good proportions, light is reflected from one facet to another and then dispersed through the top of the diamond. If the diamond is cut too shallow, part of the light leeks out the bottom. 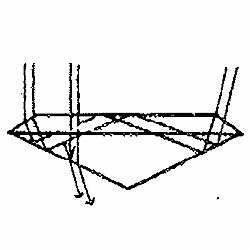 In a properly cut diamond, light entering through the table and bezel face is reflected back through the top.